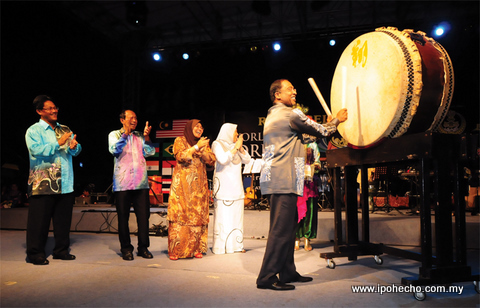 Heavy downpour did not dampen the spirit of the Royal Belum World Drums Festival 2013, as the beat of drums and percussion reverberated from Dataran MBI on Sunday, February 24. The annual fest, the second in a row, was attended by thousands of locals and foreigners and was graced by the acting Sultan of Perak Raja Dr Nazrin Shah, who officially closed the event. He was accompanied by his consort, HRH Raja Puan Besar of Perak Tuanku Zara Salim. Perak Menteri Besar Dato’ Seri DiRaja Dr Zambry Abdul Kadir, State Executive Councillors, Heads of Departments and other dignitaries were also in attendance. A total of 11 cultural groups from eight countries across four continents put up an astounding performance that brought the audience to their feet. They were Harubee (Republic of Maldives), Nakhonsawan Rajabhat University and Absolutely Thai (Thailand), Egyptian Nile Folkloric Musical Troupe (Egypt), Wicked Aura (Singapore), Tataloe Percussion (Indonesia), Pancasura (Indonesia), Wild Marmalade (Australia) and Natiq Rhythm Group (Azerbaijan). Malaysia was represented by home-grown talents, Purkusi Gatra, Aswara Percussion Ensemble and Rhythm of Malaysia. Rhythm of Malaysia, comprising students from Universiti Pendidikan Sultan Idris, won the national-level Royal Belum Perak Drums and Percussion Challenge held at Mydin Hypermarket, Agromall RTC in Gopeng earlier. They walked away with a cash prize of RM18,000. Of particular interest were the Egyptian Nile Folkloric Musical Troupe, which incorporated the tanoura folk dance; the two-men Wild Marmalade with Matt Ledge at the drums and Simon Mullumby at the didgeridoo; and Tataloe Percussion, who created music out of recycled items such as pots and pans, brooms, bottles and even water tanks. A day earlier, at the Gerik airstrip, the opening show for Royal Belum World Drums Festival was held. 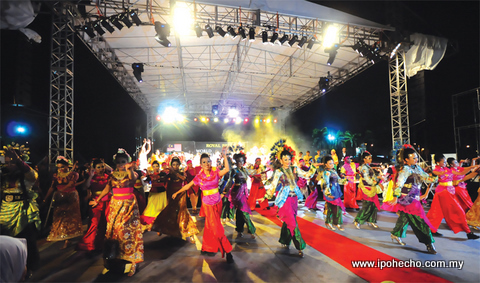 Launched by the state Executive Councillor for Tourism, Dato’ Hamidah Osman, it was attended by over 10,000 people. This drum fest, along with a number of pocket shows held over a couple of weekends in February, certainly drummed up interest and support for this annual musical extravaganza. Perakeans, in particular, got to enjoy and experience first-hand world-class music live. The success of the musical festival confirms the event’s popularity as a premier tourist attraction. The much anticipated Royal Belum World Drums Festival 2013 will be contested with a twist this year. A national-level competition will be held prior to the big day. This came on the heels of the successful festival in 2012 where participation was keen among the invited musicians worldwide. The national level competition, dubbed the Royal Belum Malaysia World Drums and Percussion Challenge 2013, will be held at the Regional Transformation Centre in Gopeng on February 16 and 17. Prize money worth over RM36,000 awaits the winners. The winning team will represent Malaysia and compete alongside 12 foreign teams at the eventual festival on February 24. “Before the main event a number of mini concerts will be held in various parts of the state as curtain raisers for the finale,” said Dato’ Hamidah Osman during a media conference recently. She implored on Perakeans to make use of the opportunity to witness some top-notch bands in action. 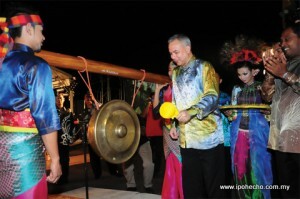 On the subject of tourism, Hamidah insisted that promotion is ongoing despite the end of Visit Perak Year 2012. The introduction of the 3-year “Discovery Perak Programme” (2013 to 2015) is geared towards maintaining a steady build up in promotional activities. Such activities are also being vigorously pursued in the ASEAN region. The tourism forum in Laos at the end of January is a case in point. “Tourist arrivals from Singapore have increased seven-fold since VPY 2012,” said Hamidah. This came about by working closely with her tourism counterparts down south. Efforts to draw more visitors from the island republic will be doubled in the months ahead. “We’ll complement Visit Malaysia Year 2014,” Hamidah remarked.